For example AAA batteries may be sold as a pack of 4 which the CRM would class as one unit, as you wouldn't sell just one battery. If you were a distributor you would tend to sell in boxes, so that box may include 50 packs of batteries. Finally, you may also sell in pallets & that pallet may include 80 boxes of batteries so 400 packs of 4 batteries. As you can see in this one example it can be extremely helpful to a salesperson to have pack configurations setup for boxes & pallets, so the CRM can automatically work out the best way to pack the required quantity of product. 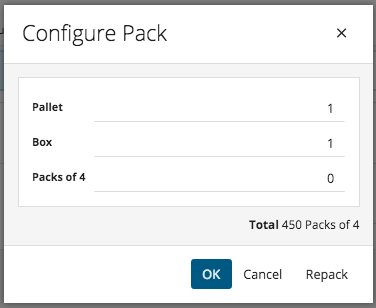 If you haven't configured your packs please take a look at the Configuring your Product Packs article. Once you have created your Quote or Sales Order, you can start adding in products that have a pack configuration. 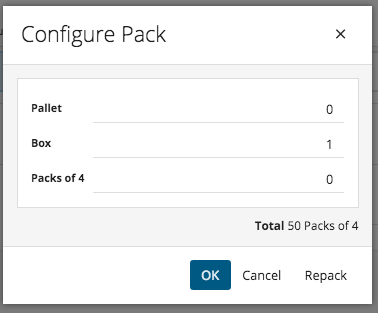 After adding the product you will be able to configure your pack based on the pack sizes available. If the sales person is aware of how many packs are in a box & pallet then they can just specify how many of these they require. Alternatively, the user can type in the amount of packs of 4 batteries they required in the bottom field. For example the customer may require 450 packs of 4 batteries. The CRM automatically recognises that this quantity can be re-packed based on the pack configurations. 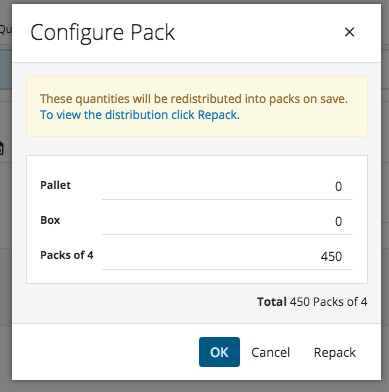 By clicking Repack the CRM will redistribute the quantity specified into packs. As shown in example, 450 packs of 4 batteries would be 1 pallet (400 packs) & 1 box (50 packs) totalling to 450. Once happy with selection click OK & the product will be added to the Quote with the necessary packs.